The Light Collection II is located at Gelugor, comprises five blocks of 7-storey condominium with a total of 297 units. There are 24 layout types to choose from, the 1-bedroom studio unit, 2 & 3-bedroom condominium, duplex & triplex units. The built-up area ranging from 517 sq.ft. to 3,617 sq.ft. Facilities at The Light Collection 2 include swimming pool, jacuzzi, gymnasium, basketball court, tennis court, landscape garden, yoga deck and playground. Built-up Area : 517 - 3,617 sq.ft. Are there still a lot of investors available to jump in? If it's RM 350/sqft, I don't mind. But if it's RM 700 /sqft, forget it. You'd be breathing in tonnes of exhaust from the traffic on the bridge EVERYDAY during rush hours. Looks nice, but not practical for day-to-day living. The good thing about Penang is, you don't have to stay all the way on the edge of the water to be able to enjoy a nice seaview. If you really have to stay that near to the water, make sure you have access to the beach (and I don't see any beach for this project), so that you can have your morning stroll on the beach with your loved one every morning and enjoy the fresh sea breeze (not car exhaust). I still not able guess with more than 3 thousand sqft, how much the monthly maintenance fees? Any special fees need for maintain reclaim land? Or it just higher than normal per sqft? RM0.5/sqft? Personally I feel this is the best in the whole 'the light' project. I believe IJM will jack up the price for the remainig sea fronting units (collection 3 & 4), probably adopting 'build & sell' strategy. Collection II...the concept, design, layout, price looks rather reasonable n practical as compare other phases..
You are right, IJM will definitely jack up the price for subsequent phases, that's a typical trick to lure buyers into buying, not for reasons of staying, but for reasons of having the "hope" to sell it later at a higher price when the price has been jacked up by developer. maybe IJM projects are now meant for those rich foreigners..God bless poor Malaysian. If you have seen the similar quayside developments in overseas, I am sure you're convinced that this kind of floating condos is NOT meant for average Joe. Normally the floating concept is allowed only for special purpose, like revitalisation of the old wharf area. In Penang, this is the 1st and probably the last... so to sell it at RM350/sqf. (as mentioned by condomana) is as good as giving away FREE. I am not from IJM, just a middle aged looking for a dream home for retirement. No offence, condamana... I respect your insights. Definitely no offense taken at all. In fact, what I was implying when I said RM350sqft was it is not worth the money unless it's given free, so that you can use it once in a while for short term stay (as to limit the amount of exhaust intake into your lungs)..:)). If you're looking for retirement stay, the beaches along tanjung bunga would be ideal. The population density in the southern part of the island is too high (2300/sqkm) for comfortable laid back living vs 600/sqkm in the northern part of the island. That probably explains why all the MM2H retirees end up staying in the north. These MM2H people used to go down south once in a while for grocery shopping (you gueesed it right, Tesco), but that will become history once Tesco Tanjung Tokong is ready. IJM projects have so far not been the target of rich foreigners for obvious reasons (note:IJM only builds houses near highly polluted expressways, rubbish dumps & waste treatment plants). However, we always hear overnight queues at IJM property launches. Why leh?? Simple : Inside traders + bulk speculators + easily manupulated poor malaysians + ad revenue hungry newspapers. So you are right hairyWong, those who go queue up at the property launches are the REAL poor fellas!!!! Gong Xi Fa Chai to the "bulk buyers" & "inside traders"!! For me, I like it's concept and centralised location... and all the present and future highways around it. Want to be an active and lively retiree. To sell it at RM1450/sqf. now, I think is a bit over ambitious. Be patience, and wait until the whole Phase I is completed... and you will see this piece of property is indeed 'price-less'. Studio Unit 517sqft and 2BR Unit 1367sqft for sale. Asking RM 750,000.00 neg. and RM 1,800,000.00 neg. respectively. Rayyap and locality, I don't think phase 1 completion itself will be good enough to justify it as the most sought-after project in penang and bringing substantial price hike as what you have anticipated. Phase II which consists of the main commercial development must really kicked off then and showing strong, positive progress in the next 3 years time in order to stir-up some strong interest and confidence among potential buyers/investors to bring up the price. This piece of land for phase II is currently under reclaimed, and understand that it may take >-5 years to complete. it is still a big question-mark whether this can be materialised in view of the over-supply situation and stiff competition going to face from gurney plaza, future paragon mall, straits quay, 1st avenue, and also the successful quuensbay mall which just next to the door-step. In addition, queensbay mall has been bought over by Singapore Capital Mall recently and it is to be sure that they will undergo massive improvement and expansion plan as well. The whole The Light project is going to take >10 years to complete, but personally i think this phase II is the most important among all which will determine the success of the project. Phase III seafront park is just a good to have, and phase IV still too early to talk about. Anyway this kind of waterfront mix development on a reclaim land is not new in penang as Seri tanjung Pinang already started much ahead of The Light. Of course in terms of design and architecture both project are unique in thier own league, but concept wise is quite similiar. Talking about competition, I believe this the most sought after location for a successful shopping complex in the island. Infact it's a THREAT to other existing complexes. IJM knows it and is trying to get the best financial gain out of it. Anyway, I don't look at Phase II at this time... of course it's a bonus to have. IJM will sell the floating bungalows at RM15 mil, that's >RM2K/sqf. Since the owners of these limited water facing properties are IJM itself and the 'super-rich'... I believe this price can HOLD if not increases. Location wise it is good but yet to be perfect as currently for those travelling from bridge, FTZ or even future 2nd bridge there is a hassle of having to make a U-turn either at tesco traffic light or the turn further ahead. There suppose to be a flyover under the original PORR project but since this has been delayed indefinitely, will depends on whether IJM going to fork out own cash to construct this once phase II is completed, this is to me an essential. Furthemore, it is individual liking whether they want their living place to be so near to the bridge. Personaly i do not mind but one of my German friend thought this is nonsense. The private sea-front in Phase I carries no meaning unless you own a yatch. 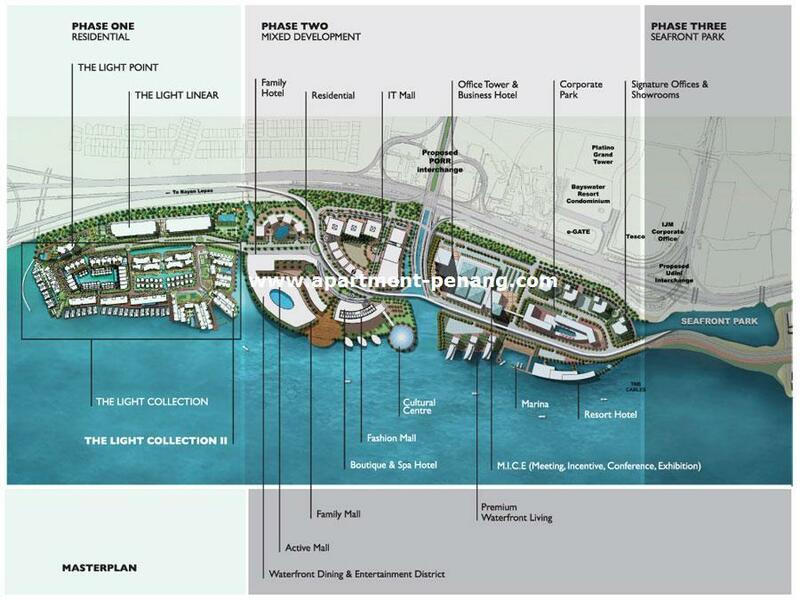 There is no promenade or seafront facilties until phase II. The "floating-on-water" units are only limited to those bigger or luxury one in collection II, III and IV. In fact majority of the unit especially those in the lower floor for light linear, light point, and collection do not even come with seaview. 1) Unique design and architecture as a whole. Not only those building on top of the sea but in general. The coral water-ways is an add-points. 2) Sustainability. Green concept is the trend in the future. 3) Residents (except linear) have the access to all the amenities within the light point & collection vicinity. Pools, gyms, game rooms all come in redundance. 4) Last but not least, future phase II commercial development. The outer ring road and the entire project will be completed eventually. I can wait since this baby is for my retirement use. I like being so close to the sea, the breeze and the sound of sea wave, the infinity pool, the 5-star resort environment... perhaps yatching in the future, all in a private community. Just one complain... IJM needs to improve its sales practice, i.e. no bulk purchase please!! all your guys are still dreaming and talking crap... there is no more outer ring roads... unless something has changed in our politic scene.. Please put political interest aside. Penang need an outer ring road. or else the development in the island will be slow or stagnant. People keep on saying improve on the infra but how to improve without the outer ring road? If penang don't think ahead of congestion, please don't built!!! and remain as a slow/relax resort town or city if you dare to call it with such a low population. move on guys. it is not this or that government. penangite need this infra.ok. Of course with the development of The Light, Penang, hopefully, can be projected as a haven for retiring, holiday home, or a quiet getaway. Unfortunately, many of us tend to forget that an island that excites are one that is pristine, relatively peaceful, clean, yet with enough local scenes for fun. PORR will destroy the little that is left of the once beautiful hill views, contribute more to noise pollution and Co2 emission on the hills and roads. People's beautiful homes will be disrupted with construction, and I doubt it will solve the congestion - it merely moves one congestion to another. What Penang really needs is a good public transport that minimises the impact on the already stressed out island. Sorry for touching on the sensitive PORR issue. As long as the council keep the 30 units / acre guideline unchanged, I don't think the island will ever be over built. It will remain a 'relax' town for many years to come. Back to The Light, I think it's going to beautify the skyline of Penang island... like what we see in Gurney Drive area. As the land price moves up in the island, lots of happenings will be moved to the mainland... the location of The Light is perfect as while we live on the island, we can still enjoy the hapennings in the mainland, which is just 10-15 minutes drive away. Property is very illiquid in Penang (unlike S'pore). Make sure you have your well-planned exit strategy in hand when the fire comes. Luckily you mentioned the coral water-ways & green facilities. I suppose that's within the strata perimeter, therefore long term maintenance is needed? That could be a big problem!! We can't even maintain lifts & swimming pools properly! That's why The Shore could be sold at RM299/sqf... is figure game. With this formula, it's quite easy to find the 'over-valued' properties on the island, and know who are the greedy developers. Back to the light, the fair value should be RM600/sqf, and I am paying 20% extra for a good location, with 'floating-on-water' luxury, which I think is more than fair. I noticed that most speculators backed out at RM600/sqf (i.e. The Point onwards)... so the Penang speculators are conservative lot afterall. This is a good sign for The Light and Penang as a whole. Regarding the monsoon drains... not all units in The Light are good, learn to choose the right unit at right price. We should learn to profit from knowledge and resources... and not by emotion and greed. Rayyap: How you get RM600/sq.ft and RM250/sq.ft?......where is your figure come from? By your determination? Determination, BIG word indeed... I do hope I can determine the figures. i m really really pissed off with IJM! currently i m renovating my unit at summer place, an ijm project. my contractors were threatened by gangsters in my own unit. they had no choice but had to pay them RM500!!!!! and i have to pay the RM500 back to my contractors. and what more? the gangsters said to my contractors they will ask for money again from my next groups of contractors (for kitchen cabinet). why this thing don't happen in platino? is it because the buyers are all have more money, so IJM has been taken care of their interests? what about our interests at summer place? why gangsters are allowed to get in to my unit? why do we pay our money to hire more than 10 guards and gangsters are allowed to go in? what sort of security is this? 3 tiers? 4 tiers? bullllllshittttt! .... IJM PLEASE ANSWER !!!! May I know how you all considering on Quayside & The Lights Condominium? I own properties in both Seri Tanjung and The Light... I like both, but frankly I am so much more excited with The Light. I see more life and energy in it, and can only describe it as the making of a new Penang... on top of all the good points that I mentioned above. Concept wise, The Light is more unique, as it breaks our Town Planning guidelines, by emerging the land and sea in the master plan. In term of capital appreciation, not sure which one will stand out, but for long term investment... personally I pick The Light. You could have been taken for a ride by your contractor or even if it is true. How can IJM take action when you can't even help them by coming forward and lodge a report? It's people like you who encourages such thing. Be brave come forward and report so IJM can start investigating. You are acting like a fool. If you want to pay and afraid to report then you deserve what you get. I heard Tesco will be closing down it's udini store after tanjung tokong is completed. Have you heard anything? Rayyap: I agree with u. THE LIGHT very special. THE LIGHT and Quayside are both different products. Both project has it uniqueness. Condomana: My fren work in TESCO said not closing the Udini Gelugor, they just open an extra new outlet in Tg Tokong. IJM staff confirmed that TESCO just signed another 30 years contract. Penang is big enough to an extra TESCO. It's good because the Tanjong Tokong resident can now enjoy their own TESCO. Good thing as it means less traffic in Green Lane between T.Tokong and Gelugor. Can anyone tell me if the 2+1 bedroom B units has 2 or 3 car parks? I like the B unit better then the C as the living room is much wider. I know the unit C has 3 car parks as i bought one. I am having buyers remorse now as I fund the living room too narrow. I think the unit B is a much more attractive buy then C.
Majority of Type B units come with 3 car parks, however there are some with 2. I also think type-B is the best, in fact it is definitely more worthwhile as compare to the Studio. Price starts from 560psf for type-b while studio >=700psf. All type B come with either pool or partial seaview, while studio has nothing, perhaps pool view of light linear from distance away. Jeff all B units comes with only 2 car parks just like the studio's. You are right the B units is a better buy. All sold except 1 unit lift and that one has "0" view. 2nd floor unit 18 or 28. About $840,000. 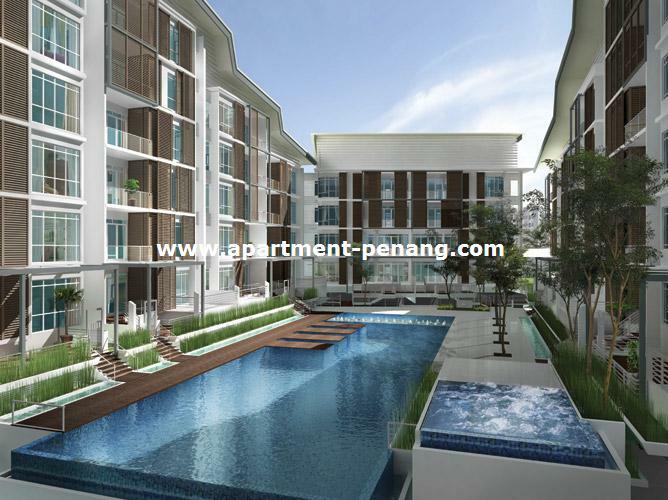 Penang Fan, as far as i know, level 2 type-B unit 5&11 were selling at ~800k with only 2 car parks during launch. There is no unit 28 perhaps you are referring to unit 18. Anyway, unit 18 would have a partial slanting pool view also a bigger balcony for garden view. I have been told by IJM staff that price for collection II has increased for ~15% since the official launch. The unit you mentioned about were actually being booked by somebody during the launch, i believe at ~830k only but then decided to let go. This unit can still be considered as the balcony is facing the collection I direction, perhaps if high enough there could be some view on the coral water-way. I am not sure if this is true, if it is, then this unit could be quite a catch still. The Light Linear will be asking ~800k when it is completed, i am quite sure, in fact already noticed advertisement asking this range of price. So Collection II which is suppose to be one class above, type-B with reasonably big layout at 1400sf (including balcony) selling at 800k is actually a catch, comparatively of course. Furthermore there would be built-in kitchen cabinet, heaters, and also air-cons. Those who have renovated before would know that these items with a reasonable quality would not cost less than 20k. The light Linear has none of these. Yes, that's true and not forgetting the Collection II comes with kitchen appliances too( Kitchen cabinet, 3/4 air-con). I spent more then 30,000 for my kitchen alone. Getting bigger units with at least 3 car parks is the way to go. If you get the bigger unit 3 at only 600 sf is a steal. Comparing it with the studio going for nearly 1/2 million for 500sf. The bigger units are worth considering. Does anyone knows whether the units with the gardens on the ground floor has been approved to be replaced by grass instead of tiles? Anyone here owns the unit with gardens at block D? Any idea when IJM going to launch Collection 3 and at what price per sqft? Is there any available unit at Collection 1? Please advice.. I'm quite interested in the Light and Strait Quay project, E&O, but now will be the hardest time for the buyer to buy properties in penang island as everything is up, greedy developer is even greedier and try to grab as much as possible. Anybody knows whether the construction has already started on the commercial portion? Can see some busy activities taking place on top of the reclaim land right currently. To me the realization of Phase II commercial development is the key factor to determine whether the whole project will be successful or not. Majority of the hottest high-rise properties in Penang nowadays are located within walking distance to commercial buildings, and I believe this would be the same principle apply to the light waterfront, eg. Bayswater (tesco, e-gate), Baystar, gold coast, putra coast (queensbay), gurney park (gurney plaza, paragon), E&O seri tanjung pinang (straits mall, tesco, island plaza, future tourist mall), tg Park (island plaza, fuure tourist mall). With the construction of a U turn just before the Penang bridge... the value of The Light definitely goes up. VERY SMART IJM, you have brains... congrats to all The Light & East Metro owners. Raymond Yap why do you think it will the value will go up? The opposite may be the case. More traffic and noise! Kindly elaborate your reasoning. From The Light to Georgetown... use the U turn & heading to town, very neat. From Georgetown to East Metro... use the U turn to reach Tesco. Before that, you need to drive extra 3.5K to make a U turn at next interchange. It is convenient for Light residents to go to Georgetown via the U turn but that will also means heavier, nosier traffic, heavier dust and air pollution. That is not desirable living condition. The U turn will not increase traffic, but to reduce traffic along N-park to Bayan Mutiara stretch. I don't see there's pollution problem because it's close to sea. This is city living by the sea... it's up to individual likings. Some prefer to live on the mountain of course. Now that Sime Darby had bought over E&O and Berjaya had bought the race course land... I foresee that the outer ring road will be revived soon. When this happens, the most valuable properties in Penang are The Light, and Seri Tanjung Pinang. My guts feeling is IJM is pushing for this outer ring road before the launching of the commercial properties (phase 2) in Light. Please do not be sentimental and political... let's talk only in business term. The global economy is not looking good, but the race course land and E&O were bought at high prices... definitely not wise in business term, unless the buyers have inside information in the Federal Government that the outer ring road will be revived soon. Or else, the buyers should use the current economical situation as an excuse to press down the price, but they approached in the opposite way instead, buy high and fast. I think they are chasing time here, probably because the outer ring road will be announced before the general election. Just a thought... appreciate any inputs. When there is over supply. Developers will compete and buyers will benefit. May the best win. Location, quality and pricing are keys to success.It is a good thing for consumers. Does anyone owns a unit in Light Collection 2 here? The project is currently at piling stage. I think it should complete piling by October. Light Point is now at 23rd floor. Light Collection 1 is now at 1st floor. I have a type C unit facing the pontoon... it's for own stay. I have seen this concept in Auckland and other places, loved it so much. When I saw The Light, immediately booked a unit in collection 2. To me, it's a dream comes true. Thanks tyh, please keep us updated... and this is a great place to share informations with our fellow C2 owners. I think RM0.38/sqf. maintenance is fair... to make sure the MC has plenty of fund to service the coral ponds, and to upkeep the PRIVATE waterfront, e.g. mud, erosion, etc. I am not sure how they will operate the pontoon, with the limited bays. Hope the MC will provide a boat renting service for the residents, and also a ferry service to the future marina, and maybe Pulau Jerejak. What I mean is the pontoon should be made good use to benefit the residents. If it's well managed, I don't see why it cannot be the most sought after property in Penang. I think The Light is an architecture genius. To convince myself, recently I went to stay in Penangi in Langkawi, and also the ground floor room in HardRock Penang that opens to the pool. I realize that the excitement is not the view, but is the community that connects to the nature and the great ocean. It's the connection with the sea, sky and greenery that makes us feel where we should belong... and of course we also need the life in the community. I don't want to sound too poetic, but this is what I see in The Light. Piling works are on block C now. Just noticed that blocks E, F & G actually jut out into the water, just sitting on stilts, like the 'RM15 mil' bungalows. The stilts concept is not obvious in the artist impression but can be seen in the model (on closer look). This architectural masterpiece is 1st in Penang, and probably the last. By the way, collection 3 atill hasn't launch yet. hmm..
1) Public access to waterfront. 2) Building set back from waterfront. E&O complied to the rules, IJM exempted... I am not sure if other developers will have this special privilege like IJM, it's yet to be seen. Hmmm. That makes sense as well. However one setback that I could think of is that eventhough it is a seafront development there is no beach at all. How i wish there is a beach connecting to The Light. That would be so cool. haha... I know I know. The best beach in Penang is on the 2 little islands next to Penang bridge, it's right across The Light. In futute, we will see Light residents on these 2 island during the weekend, haha, probably I will be the 1st one to land on it. The 2 lil islands existed because they were the left over soils used to built penang bridge previously. Maybe we can buy it over from Penang state and built our so called Richard Branson Necker Island. I strongy feel that IJM should revive the 2 little islands connecting to The Light. I'm going over to The Light tomorrow. Hopefully there is more progress by now. Just checked on Google Earth, the size of the larger island is approx. 6 acres, and it's about 800 meters from C2 pontoon. The size of the smaller island is 2 acres, and they are 200 meters apart. With RM0.38/sqf. contribution from Light residents, and if the fund is well managed, I see the great potential of turning The Light into the most valuable property in Penang. The location of the 2 litle islands are so strategic... imagine the view it commands. Based on land area of Point & Collections, the MC is collecting approx. 6.5 million annually on maintenance charge. Yes the MC can afford to build a temporary shelter and toilets on the island, and during the weekend provides a ferry service to the island at maybe 1 hour interval. This kind of additional facility and service won't cost much... and it will increase the property value of LIGHT tremendously. Imagine this kind of privilege is exclusively for LIGHT residents only. Are you guys really serious? IJM can't even provide their "4 seasons" garden at Platino, how to develope "Fantasy islands" for the buyers? IJM dreams again.....really respect IJM on what they can influent people to continue their dreams....one project to another.......when will Penang kia stop buying from IJM? Sokohow. I've seen lots of people condemning IJM for the high selling price, chicken fence and etc. For me is pretty simple. If you like the project and you think it is worth buying for investment or to live in then just go ahead. Follow your judgement/instinct. There will always be risks in every property we invest in. I guess we just need to write to the top management of IJM to suggest them this idea... I think they will buy it as it will help to sell their RM15 million bungalows. If this option fails, we let the MC implement it. A 5 acres 'fantasy' island surrounded by white sandy beach... it is not a dream after-all. I have talked to IJM on the 'island' idea. Hope our fellow LIGHT owners here will do the same... the louder the voice, the better the chance. Wow.. You did approach IJM about this idea? Which guy was it? Alfie, Ooi or?? I think if IJM decided to adopt the islands connecting to The Light it will also help to upsell their Phase 2 commercial project. The 2 lil islands have historical background and should preserve it too. :) It will take a while before The Light MC took over the mgnt. Sorry I removed the last post not because of condomana... just thought I should not disclose unnecessary information. You don't have to be sorry Raymond, but It doesn't favour you by removing your comment who made condomana puke. Your idea and suggestion is brilliant until you remove your comment. Now i wanna puke because you are afraid of criticism. My purpose here is to share / exchange information with Collection 2 owners... that's it. Guys. Stop critising. It should be a platform for us to share our views/thoughts about collection 2. No idea is a silly idea except those who don't contribute to ideas. Another option is to get the NGO to lobby to the state government to open up the island for public access. It's confirmed that the island has been gazetted as state land. We should do this before it's given to a private company for development. Good point ele. We don't wish the island becomes an eye sore to LIGHT residents. In the worst scenario, the island is developed into chalet hotel like what we see in Langkawi... is not bad looking, just that it's closed to the public. Even if it's left untouched... it is still a good Play Land for LIGHT residents, who can easily reach there with boat and jets ski. Another place to explore by LIGHT residents is Pulau Jerejak. So we just need to make sure that the pontoon in LIGHT is well managed to promote more marina activities for the LIGHT residents... what we need is a good MC. The design concept in LIGHT opens to many possible excitements and activities, which are yet to be explored. The forum is a great place to exchange ideas, so that all LIGHT owners are well informed of its potential. Condomana. If you have any better idea feel free to share with the rest of The Light residents. If there is no better idea you may opt to listen to others only. To maintain the pontoon is a tough thing to do. Quote an example my place barbeceu area used to be made out of woods and it only lasted for 2 years and we have to changed it to cement. I feel that penang is lack of beach cafes. It would be good if the islands can be commercialize. Beh Tahan..... No doubt this tread is the most ambitious if not terror... Pek Chek!!! This CondomMana and CK can be seen in almost all property thread offering their "expert opinion". I wonder how many property do this "expert" owns. Not only in this website, but other website too. Care to tell us? Why you so like that one? May Enneh Kuan Eh Boh? OK la.... my intention is harmless la... in what sentence did I offered my advice here. Wishing the good people here all the best is a crime ah? I beh tahan the comments here as it tickles my funny bones, like that also beh sai meh. You have no sense of humor at all. Why want to know how many property I own. Your question itself is irrelevant it is stupid. You want to attack my home izzit? I am harmless la, I believe the good ppl above is also harmless as they are so cool headed in digesting all the whacking before. I sincerely had goose pimples or "Moh Kah Khia Kah Liow" digesting some of the ideas here. Not a crime right? tyh, what I mean is I do hope that a few boating bays are reserved for LIGHT residents use (sharing basis)... I don wish IJM becomes so greedy to rent out all bays for their own profit (they have the right to do so) and NO bay left for the residents. What I mean is the pontoon should benefit the residents and not benefit only a few individuals. The pontoon is so small, and I believe it can only hold about 10 boats or so. Today, our CM announced about the commencement of 3rd link by end of next year, followed by the 2 expressways from Ayer Itam and Gurney Drive linking to Jelutong Expressway. LIGHT is right at the center of the 3 links and is at middle of the all expressways. So, I think IJM knows the right time to launch the Phase 2. So, I am not too worry about that. A lot of oversea fund managers are eyeing on this. There will be another marina bay at phase 2. It's for phase 2 residential properties. ya. i agreed with you that The Light will be at a central of road access to the north and south. Furthermore with the soon to built U-turn road access to tesco before the penang bridge it will add more value to The Light. Chin, you may go to mudah.com to search for Collection 2. I saw someone is selling 1600sqf with 400+ sqf garden for 2 million+. Why not you go to IJM office to enquire about Collection 2 units? i think there are still few units available. HAHA. That owver is too much. I think he is trying his luck. Instead of buying this unit why not buy the water villa instead. I'm at your side too Penang Fran..:) By the way, Collection 2 launching on 2nd Oct. Penang Fran I think you had a unit at collection 1 right? There will be a briefing by IJM on 30 Sept ( Friday )for The Light owners to talk about all The Light amenities/facilities and etc. I dont have the full agenda. Raymond & Penang Fran. Are you guys joining? It's at 11am. tyh, you mean collection 3 launching soon. Collection 2 was launched months ago! No I bought collection 2. I think it is the best among all the collections series in term of pricing(600 to 800Rm a SF) and location(nearer to the shopping mall). Collection 3 at hefty min. 800Rm per SF onwards and it is nearer to Penang Bridge- Noisy and polluted!!! tyh, thanks for the info. I will try my best to be there at the 30 Sep briefing. Very keen to know how would they run/manage the pontoon, and what's in the club house at the other corner where the wind power generators are located. The marina at Phase 2 is a full marina with clubbing facilities that have hundreds of birth and can hold large ships... whereas the pontoon at C2 can hold only 10 small boats (6 meters length) or so. The share facilities for Point & Collections is very interesting and creates a very resort like environment... it's 1st of its kind in Penang. The coral ponds can be so beautiful, I saw a quite similar concept in a hotel in Langkawi, is breath taking. Wake up guys! Go see what happened to Platino! All you guys will regret knowing IJM!!! Their GM was scolded "Stupid"! by the residents this morning! Opps Sorry Penang Fran...Ya. I meant collection 3. Collection 3 starting price is 1.1 million and above with minimum 600 per sqf to 1200 per sqf. I agreed with you that Collection 2 is the best among all. I originally wanted to buy Collection 1 but then IJM told me that they were luanching Collection 2 in another month or so.. So i decided to wait and I have no regrets waiting. :) Among the Collection projects I like the Bungalow by the sea ( too exp for me ) the most, followed by Collection 2. Oh ya Raymond. The pontoon only for the 2 boats for residents to rent only. We can't park our private boats there. Not even rent the bay..Just checked. Bayswater 88. Any idea why Platino residents aren't happy with the IJM? RM1200/sqft., I believe this is a record figure in Penang, overtaking Seri Tanjung Pinang... and LIGHT will break another record when Collection 4 is launched. They can sell the highest price but can they provide the highest level of customer service? I heard got problem at their current condos, the management will always said tomorrow la..... and tomorrow never end, emergency also tomorrow? Ya. Highest ever. Cant wait to see how many people actually queue up to buy it on 2nd Oct. If response is good our collection 1 and 2 demand may be good also..For me IJM service was quite ok. I never encounter any issue with them. We have come to a stage now when LIGHT is not for speculation, but becomes 'toy' for the rich. For Collection 3, I think the problem is not the RM1.2K/sqf. price tag, but the only concern is the mud and water pollution in that side of the sea. Even so, what IJM need now is 25% sales which is enough to fund the construction of the whole Collection 4... 25% sales is 'easy water' to them. Who doesn't dream of a house 'floating' on the sea?... if he can afford. Does any body knows where the Surau for this Collection Series is located? I am very annoyed with the call of early morning prayer living in Platino. Usually these obnoxious activity wakes me up. I cannot even open the bedroom windows as it would even be louder if I did. So I always sleep with windows closed. Thanks God I have air-conditioner and heavy window drapes. All new condos built near Surau or Mosques should have double glazed windows and doors to keep these intruding noise down to a tolerable level. I would never buy a condo near Surau or Mosque ever. Penang Fran.. You brought up a good point. I also wonder where the surau will be. Maybe we can check out with IJM during the briefing for The Light residents on 30 Sept. I think we can find the exact surau location in The Light on our SnP which has the whole Light master plan.. Not sure but I will try to check out this evening. Regarding Collection 3 in terms of location wise not so good compare to the rest of Collection however in terms of privacy and the size ( with swimming pool ) i think it is quite nice. tyh, I am glad someone share the same view about annoying loud morning prayers. I do deny that we are living in a predominantly Muslim country and I respect their 5 times call of prayers but it is the morning call that bothers me most. They should not need a loud speaker blasting away as there is not competing background(traffic sound) sound in the early morning. I wish they have more common sense and be more sensitive to the rest of us who need our sleep. I believe Penang Fan was talking about a mosque located nearby of Platino. Surau is just a small room located in the common area of the apartment. Usually, after OC obtained, the surau is converted to other use. Surau is never shown in the marketing brochure, but can be seen in building plan. Regarding service quality of IJM, the residents have the right to appoint a 3rd party property manager after 3 years (I believe it's in the housing act). I don't think IJM is interested in property management anyway... it's their business to make profit from property development, and not property management (which just a free service after sales). Bayswater is managed by Robert Bench now, if I am not mistaken. fl09, I think I can answer your question as I live in Platino. This is my first experience with IJM and so far I am very pleased with them. Whatever problem I have the management took it up and resolve it in a timely fashion. I would recommend IJM as a responsible and caring developer from my personal experience. Yes, Raymond is right the present Platino management will disappear after the strata title is granted. Residence will have to find their own management to run the condo. So far IJM appointed management team is very commendable under Mr. Khoo Boo Hock and his able right hand man Mr.Tony Choy. I dont think we have to wait for 3 years to take over the mgnt. I believed as long as we have 50% of the residents have strata title we can call for AGM and plan for take over right? While in transition period we have JMB and then finally we full take over. For me personally IJM did a good job while running my place mgnt.Penang Fran I share the same view as you regarding the surau. If there is at least one muslim resident staying in the whole project they will very likely do up the surau and invite friends over for prayers. I doubt the Light surau will be converted for other use. Over here my place the little temple used to be placed inside the property compound but there was complaint by non-chinese residents then the little temple has to be moved outside the property. tyh, it don't make sense. If there is only 1 or 2 Muslim family in the condo can we ask that the Surau be removed? Why is the temple moved out just because of 1 complain by a non temple worshipper. It should work both ways. Just got IJM invitation for Collection 3. Are you guys going? Minimum RM1.2 mil... go there to have a cup of coffee is it? Pity Ivory, always 1 step behind other developers. Earlier it was Time Square, now it's Bayan Mutiara... in my opinion, the chance of Ivory success in Bayan Mutiara is very slim. In view of the current global economy situation... remember to invest within your means, a recession that can strike anytime. If really 0% i think still can consider. Well it depends on how we see it. Some investors are taking recession as an opportunity to grow their investment as they get better offer for purchase. Quoting an example Malaysians are now buying properties in London and New York as the properties prices have dropped due to recession. By the time they are out of recession these investors are making big bucks out of it. By the way, why do you think Ivory future project at bayan mutiara a failure? The location ig good and with the latest project by GSD Land ( Summerton project ) coming out soon it will boost up the demand too. tyh, I see your points, just be careful, you know your own capabilities... to me, I am in a 'holding' mode. wah, wayang kulit still not done ah?!... :D....very "loyal" to IJM huh! I think it is too early to talk about the 2 tiny island beside the bridge. Few things worth mentioning about the management. When OC obtained, JMB is formed, lead by developer. Most of the developer overspend on a new built project. IJM will apply strata title for the residents within this year. However many developers don't do that because law is not enforced. Without strata title, you don't own the land. That is why choosing reputable developer is crucial. JMC will be formed on the following year, very similar to JMB but more residents involve. Strata title should be out on the third year (if developer applied). Residents SHOULD APPLY for strata title to protect their interest. getting strata title means you own the certain portion of the total land, depending your share in the property and IJM has a formula to calculate it. IJM will pass management to resident and MC will be formed, and those residents without strata title, sorry you can't vote or get elected. MC is wholly formed by the residents and it has every right to change any house rules. After MC, "fighting" will start between committee members and accusation of corruption and cronyism will surface. That's typical in Penang when you have many unoccupied units in a project, resulting in owners not "willing" to pay up maintenance fees with the excuse of "my apartment cannot rent out". When money runs short, temper runs hot. Remember the lady owner in Bayswater? She was brought to court for refusing to service charge. She finally paid up to avoid losing her condo. Just checked the S&P, pontoon was listed as common facilities in the schedule, which means the pontoon is actually owned by the residents, and later will be managed by MC when it takes over from IJM. So this rests my earliest concerns. ... thanks jack1981 for your valuable inputs. Yes, no doubt cronyism and corruption is practically unavoidable. But we can minimize it. Residents have to care enough to put their eyes on managements and committees. GET YOUR STRATA TITLE. However, being one of the committee members is not easy, especially at this high end property because most residents are professional or highly educated people, and they will give lots of pressure to the committees. I am hoping residents will appreciate what the committee members have done. As usual, I welcome any constructive discussion as I know our time is priceless. Under clause 11 of S&P, it's IJM responsibility to apply for strata title, and then to forward a copy of the title to the purchaser. So, I believe as a purchaser, we do not have to do anything, the strata title will be sent to us, once it's available... correct me if I'm wrong. Typical developer trick is to delay the issuing of the Strata Title, claiming the authorities is slow in issuing. This way they can hold on to be the Management and continue to milk the residents, until such time that they think they already earn enough. Typically this takes up to 10 years or more, if the residence does not make too much noise, which most Malaysians will be, since they are rate as some of the most submissive people in the world. Then they will finally get about issuing the Strata Title and pass over the Management to the Management Council formed by the residence. Then you will discover that the account is practically emptied, or they have not been charging their own empty/unsold units for any maintenance for the time that it is still under the developer. Then starts all the legal fight to recover the money, which drags on for years. Btw, for these million-dollar condos, I doubt it will be occupied much. most nights you see only 4~5 lights turned on. you hardly meet anybody else. So, you better make sure the security is super-secure and you trust the security that there is no inside job. I remember my lawyer told me that, under the new rules, strata title and vacant procession will be issued at the same time... I am not sure how true is that. But anyway, it's advisable to purchase only from the reputable developers. Regarding occupancy rate... if you look at the overall design concept of LIGHT, I think 20%-30% occupancy rate is ideal, >80% occupancy would be a nightmare. 20-30% occupancy rate would not be sustainable considering that the maintenance is pretty high. For the size and concept of LIGHT, low occupancy is still the best. Mud tends to accumulate at area where there's a sudden recess of land, e.g. gurney drive, weld quay, and recently at the southern end of LIGHT... reason is water current cannot bend & turn, it follows its natural path. So, with an occupancy rate of 20-30%, you expect 3 out of 10 home owners to be paying for the maintenance fees for everyone else? Most likely they would just pay for their own units and when this happens, your so called 'dream land' would not be sustainable. The same applies to Quayside at Seri Tanjung Pinang. Hence, they made us sign an agreement at E&O that they would do whatever it takes to make it successful and i do believe the Light does not have such commitment included in its clause. Besides if you know anything about coral reefs, you should know better it takes a lot of cash to keep the entire concept alive. LIGHT 'Points & Collections' will be collecting >RM6mil maintenance annually from unit owners... that's a lot of cash. There's no mention of 'coral' in S&P and Mutual Covenants. The pond is not listed as common facilities in S&P, but is referred to as waterways in the Mutual Covenants. So, coral is just part of landscaping... which can be omitted or replaced with other features if necessary. i still don't get the logic. You want an occupancy rate of 20-30% but at the same time you claim that the Light management will be collecting >RM6 million maintenance annually from unit owners. So let me ask you. If the occupancy rate is only 20-30% and the facilities are not being used by the other 70%. Why should the 70% contribute into maintaining the place? You need an occupancy rate of at least 75% to make it successful. I rest my case. All unit owners must pay monthly maintenance of RM0.38/sqf regardless of occupancy... even if owner goes bankrupt, the bank has to pay the money owed. Yeap, you have to pay maintenance whether you are staying there or not. We don't have to do anything but just monitor the progress of application (strata title). Under Housing Development Act (HDA), all developers are responsible to apply strata title, but HDA or S&P did not mention about what if the developers don't. if strata title is not obtained, which means the land is still belong to the previous owner (in most case developer). You will lose everything except the building if the developer went bankrupt. From my understanding, maintaining coral and "nemo" like those in airport is money leaching activity. They must periodically replace the bleached (dead) coral and fish with the new one. Whether the hard coral can be sustain or not, we don't know. But since the maintenance is super high at RM0.38/ft2 I am quite confident we have the money to do that. I heard IJM will hire a company from Australia to maintain the coral pool. What is unique about the light collection without coral pool? numerous swimming pool? Strata title can only be APPLIED after the OC, and VP came before OC (usually 2 weeks). It will be great if we can get both (OC and strata title) at once but it is practically impossible. Have you not noticed Raymond Yap is not very familiar with "Penang Style" strata living yet? I'd bet he has not been in a residence committee before, therefore not knowing how much it costs to run a decent condo project. Oh yes, you can sue, you can publish names at the lobby, and you can get counter-sued for defamation, or maybe management cannot locate the owner because he/she resides overseas, and before you know it, arrears piled up to tens of thousands. In summary, the more money you need for maintenance, the higher chance of problems...Good Luck! hey. any interesting news on collection 2? Selling Light Colection 2 unit B1 for 1.33m. Went to COB meeting once and noticed most of the non paying maintenance issues are from middle-low apartments. That is the reason why I only invest in middle - high condo. Wondering why IJM still hasn't ask for the 2nd payment of another 10% yet. Is the piling an issue? Not that I am complaining but it's a year since they collected the 1st 10%. I am happy not having to pay any interest yet. Penang Fran. Just received a letter today for the 2nd 10%. It has reached the framework completion. You should be receiving the letter soon I guess. The LIGHT is very impressive viewing from the sky, especially Collection 2, with the stilts on the sea water. Guys. Any updates on Collection 2?In 1-2 days time the road going into Light and Linear should be ready. Wonder whether we can drive in to take a look. Yeah TYH I just made by 2nd 10% payment. Which type did you bought? I got the C type. Resellers now asking for 2 millions. Thanks! Me too. Just started my 1st installment this month. 1st 10% and 2nd 15%. i got type B1.Reseller? You mean external buyer or IJM who sold you the unit is asking you whether you would like to let go? Wah...so fast higher than Gurney's price liao? Gurney II lowest price is about there but 3K+ sqft. If it is real congrats to both buyer and seller! Hi TYH, why is your 2nd payment 15%? Mine is only 10%. It should be the same as it is standard 10% stipulated in the Sales Agreement as drafted. Are you sure you have to pay 15%? Make no sense. Penang Fran. Yes. It is correct. The access road is completed... managed to drive in today to view the project. Light Linear, with the glass balcony railing is definitely 1 class above Platino. Colletion II is meant to be higher class than Linear... I foresee it's going to be the best quality. BTW, buyers of block F & G have not been billed for the 10% "work below ground". Huh. Block F & G? i thought until D only? Hmm. Im going to drive in this saturday. Thanks Raymond. Btw, did the security stop you at the entrance to go into Light? There's no security at the entrance... sooner or later the access road will be opened for public use once VP for Linear is obtained. I realize the design of Phase II commercial has been amended again... to a more realistic design, with clear cut parcels of hotel, shopping complexes, etc. BTW, the site of Phase II is ready for commencement any time soon. Iam quite interested in type B2, but understood from IJM land no more units left. If I want to buy from sub-sale, what is the price now? The last time i visited the office, IJM still have a few Light Point and collection I lower floor units for sale, price around 600psf. However after knowing there would be no seaview, I might as well going for collection II. Yes. I think they most probably launching commercial soon by next year to compete against upcoming commercial projects at penangworldcity and southbay. I dont think there is anymore units for B1 which is without garden. If you're looking for B2 i may think of subsale once OC. If you're interested let me know. For collection 2 only those lower units facing Light Linear are still available. If you're going for Collection 1 I suggest you go for Collection 2. I almost bought a unit at Collection 1. Smallest unit. Only 2 of them available. If not mistaken they were selling for 720k that time. The rest which are bigger units starting price was 800K+. Managed to sneak in last weekend.the reclaimed land is huge.i did not expect this.from main road it was like not so big.the linear looks nice especially the glass pane balcony.the collection 2 is nice.but it looks different from what appeared in the brochure.i thought the grd floor unit should be on par with the land. The grd floor unit seems like 1 floor higher than the ground. A bit dissappointed coz I was looking fwd for my unit to be same height as the land itself. TYH, I agree with you. But the ground level is designed for carpark use. The swimming pool level is actually on the 1st floor, which is half a level up from the entrance driveway. The internal driveway is actually half floor above ground level. It's a clever playing with levels, without digging underground. A bit dissappointed because of that. :) The reason why i bought the ground unit was thinking that i can do gardening like planting some smal size tree and etc. Since it it built above the grd floor i dont think I can do that anymore. When I bought the unit I specifically asked them about the garden. They initially wanted to cement it but then they change their mind to plant grass instead. So I bought it. By the way, did you mnaged to take a look at the studio unit? it looks quite small. i took some photos when i was there. i can share with you if you want. just give me your email will do. CK. How can I post the pictures here? Any idea? You can send all photos to apartmentpenang@gmail.com but please specify the project title or name. They will put feature your photos at the related site. I just sent 4 photos to that email address. hope they will publish it. thanks tyh, IJM also updated their progress works photos at www.thelightwaterfront.com ....u can view from there. very impressive! welcome. I'm looking forward to the whole Collection community when everyone moves in. CK & Michael. Are you going to move into Collection 2 next time? So far I know Penang Fran & Raymond are my future neighbours. Just wanted to get to know more of Collection 2 owners. Thanks Tyh, for the updated progress photos. Looks like they are in full speed ahead to meet the Jan 2014 dateline. I hope that will not mean sloppy workmanship too. This is their luxury line and I will be very disappointed if they are not careful with the final quality. Can't wait to see this unique one of a kind development in Penang. I am confident that resellers will be able to make a kill after OC. I prefer IJM spend more time on the 'water' foundation, which they did. For 4-7 storeys building like this, to complete it in next 18 months would not be a problem. Once the shopping complex is completed, this new icon (Collection II) will be admired by millions of mall patrons. I forsee 2 hikes of price/rental for Collection II... 1st after OC, and then 2nd hike after Phase II shopping mall is completed. It's not surprise if it becomes the most expansive condo in Penang in term of price/sqf. Block E has reached 5th floor. Block D has reached 4th floor. Block C has reached 2nd floor. A bit slow on those blocks partiaally built on the sea level. If they continue with current speed i think Collection 2 can finish completion by Q3 next year. Does anyone have any update on the new development of collection 2.. how much is it selling price now ? You can check with the developer if any units still available, although i doubt so. During the initial launching, the units are priced from 570 to 700psf (studio). For bumi lots release, IJM would normally increase the price by another 30%, in this case you are looking at range from 700-900psf. I drove to the construction side the other day. Look very unique and should be very nice when done. Still too early to tell whether people buy on speculation that it will go up in price when it is completed and whether it has enough fund to sustain and maintain of such big facilities if people stop paying maintenance. I believe we can wait and see when the OC in linear is release to find out how hot is the subsale of the apartments in Linear. If Linear is selling good than the collection 2 should be better. I just forward a few more pictures of new development in collection 2. Block E reach 3rd floor , block c 5th floor and block d 5th floor. what is the size available (prefer those small size)? Does it comes with furniture like Straits Garden? What's the price of the smaller units? Firstimer, all the information you wanted to know is at the top of this blog. All smaller units are sold out on 1st day launch. Air-con, build in vacuum and kitchen cabinets are provided but no furniture for living and bedrooms. Firstimer, you should visit to the office. I was there last week still a few units left from collection 2 but definitely no more small units. Thanks for the info...unlucky for me.. I'm actually looking for small studio suites for my own stay (budget around RM300 to RM350k). I think the Studio Suites for Light is the most affordable in terms of total value right (i'm not calculating RM/sq Ft)? by the way, may i know how much if the monthly repayment if we take a loan, say about RM300k, RM350k or RM400k? I don't know what the loan for 300K. I took a 800K loan and I will pay about 6,000 a month for 15 years. Looking at those pictures that I posted of block E for the units that facing the pontoon and with deck and garden can imagine that when it is all completed it will be a very nice unit to own. I wonder how much are those units ? Frank, those E blocks unit goes from 2.2 million and upwards. The "C","D" and "E" lines range from more then a million to 4.5 millions. You need to be a multi millionaire to own one. Nice photos by Frank 64... Thanks. I believe it was high tide when the photos were taken. During low tide, the stilts & floating effect will be more obvious. Mine is in block F. FYI, I haven't received the billing for 10% "work below ground". wow ! way too much for me to own one. may be can wait till the subsale to see how much is the studio suite to buy. To watch the IJM collection youtube and to drive thru the construction side you can foresee the future look very nice at The Light. Those people who own the units at collection 2 must be very excited about it and very fortunate one. I heard from construction workers that there are some foundation issue for block E,F,G. Hence the delay in completing the under ground works to date. Block C and D have been billed for up to 35% to date. Not surprising E, F, G are still not certified to bill for the 2nd payment of 10% "under the ground work completion - meaning foundations" due to the complication the engineers are encountering. Any development on reclaimed land are very risky and esp. so when it is under water. I hope these issues will be properly addressed and will not come back and haunt dwellers of those blocks. The bedrock with marine clay which hold the foundation under the sea can be very tricky and risky. This is one of the high risk buyers of such high tech development will have to endure. Chances are IJM will do a thorough job to guard their reputation for the future. The concept is new, but the engineering is not new in Penang. Beside IJM is a major construction + engineering company. I would say it's higher risk for the developer due to unforeseen cost & time factors. My SNP was signed on Jan 2011. Jan 2014 will be the targeted date to hand over. If the E, F,and G has not even finished the foundation work to date. There are only less then 16 months left to complete. I doubt IJM can deliver it in time. Looking at the masterplan, it seems that the development is very congested with insufficient open space. High density. From the picture that I posted I believe the Block E foundation has already done and I forgot to take the pictures on Block F. I was very impress with block E units that sit next to the sea. Must be very nice when it is all done.